The Physics & Astronomy Colloquium Series presents Ward Plummer, of Louisiana State University, on “Hidden Bulk Phases Revealed by Broken Symmetry at a Surface”, on Friday, Feb. 22, at 4:10 p.m. in Clippinger Labs 194. Abstract: If you have taught or attended a condensed matter physics course, you know that the subjects are compartmentalized: lattice structure, electronic structure, lattice dynamics, magnetism and superconductivity. 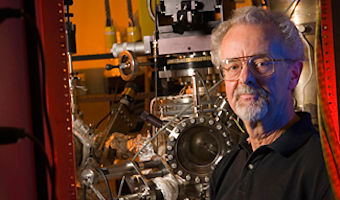 The modern world of functional materials is not compartmentalized; it is the nonlinear entanglement of lattice, electron, and spin degrees of freedom that creates functionality, such as superconductivity, magnetoresistance, quantum criticality, etc.. Functional materials respond to external and internal stimuli, like temperature, pressure, field, or doping. The goal of materials research is to learn to manipulate, control, or design the desired functionality. One way to reveal new (hidden) phases in bulk is to explore the functionality of surfaces in an environment of broken symmetry. Our group has investigated the surface properties of many complex materials, including Fe-based superconductors. In this talk, I will describe the surface properties of Mn-doped double-layered ruthenate, Sr3Ru2O7. The surface, because of structural reconstruction, displays fundamentally different behavior from bulk—metallic when the bulk is insulating and visa versa. Our work show that creating a surface by breaking the translational symmetry is an effective way to reveal hidden phase’s non-existent in bulk.